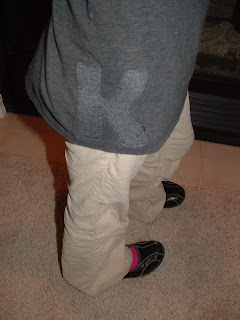 Maybe you've been wondering where I am...or not...we've been thoroughly enjoying a visit with Little Brother's birthmom...plus the day getting ready for her visit and the days catching up after, so blogging has been on the back burner. We did some fun stuff with her, which deserves sharing, but I figured I better go ahead and post about this since Thanksgiving is almost here and if I wait much longer, it will be too late. 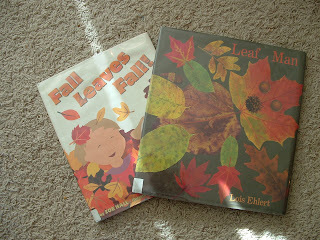 We read Fall Leaves Fall by Zoe Hall and Leaf Man by Lois Ehlert a couple weeks ago. They're both wonderful. You really can't read Leaf Man without making leaf pictures, though, and Fall Leaves Fall had some leaf pictures in there too. 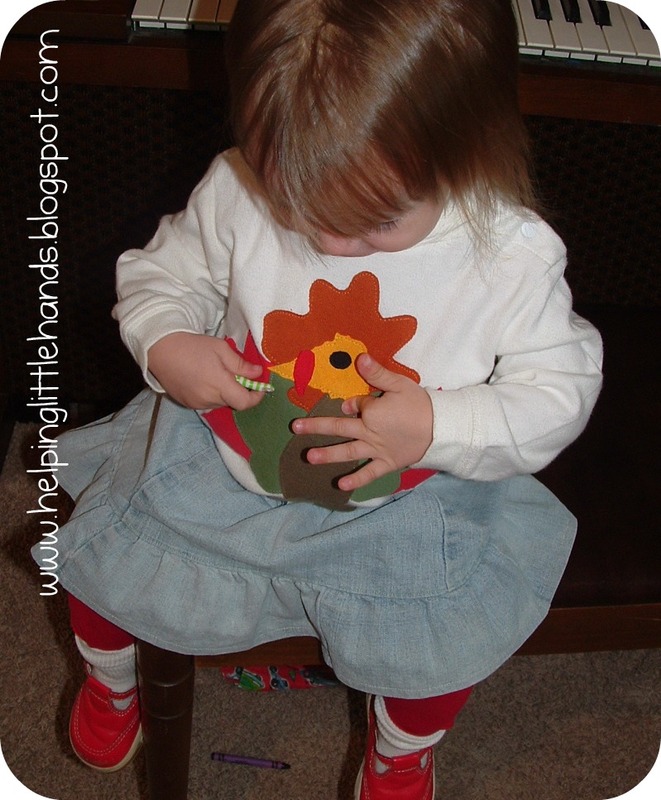 We decided to do our leaf pictures with a different twist, though...we made them out of fabric. Ahead of time, I traced a bunch of leaves out of Leaf Man onto some Heat'n Bond Lite. 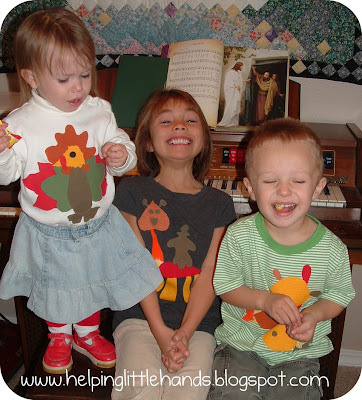 Then I ironed them on to T-shirt scraps of all different fall colors. Then I cut them out, so they'd be all ready for the kids. 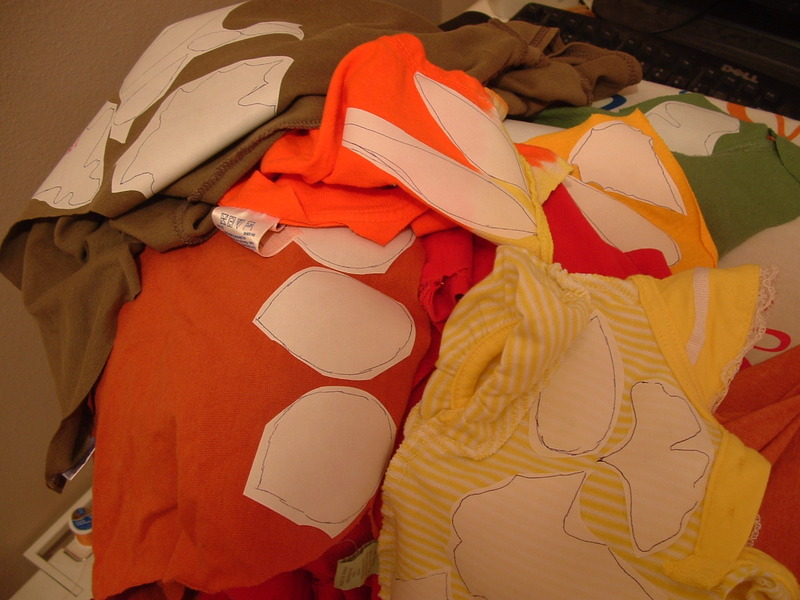 Then I pulled out some shirts from my stash. (I keep an eye out for cheap plain knit shirts at thrift stores to have on hand when I want to do applique projects. For me it's easier to buy the shirt than to make it.) Then the kids had fun pealing of the paper backing and arranging their leaves onto their shirt. 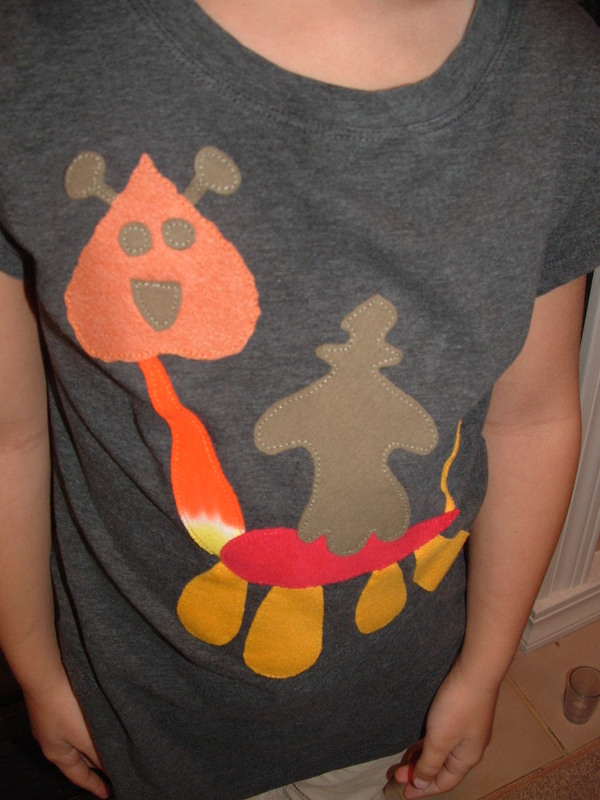 Firecracker came up with her design on her own. Can you tell what it is? Little Brother showed me his favorite leaf pictures from Leaf Man, and I helped him arrange the leaves. 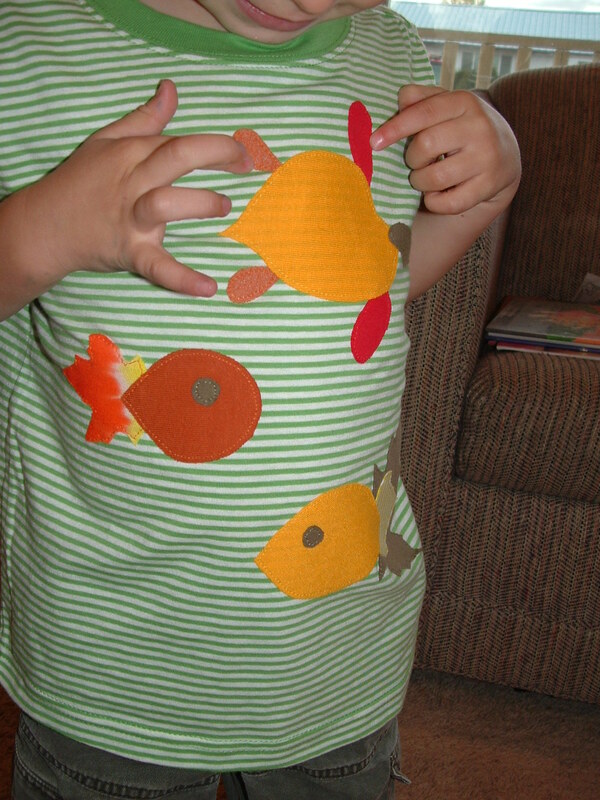 He has a turtle and two fish. 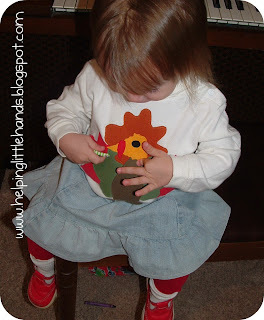 And I did Sweet Pea's shirt for her since she was ready for a nap, and I wanted to try my hand at a turkey. 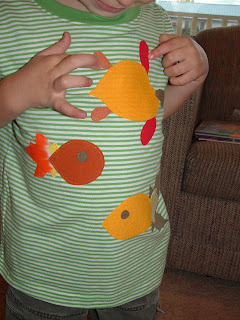 After the kids arranged their leaves, they helped me iron them down, and I sewed around the edges after they went to bed. 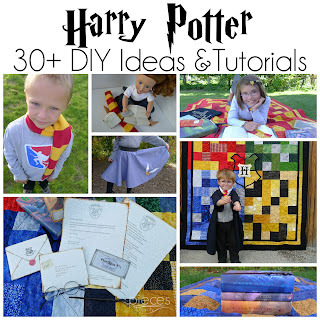 You could do a no-sew version if you buy the Heat'n Bond Ultra that doesn't require sewing. I just like the way the stitching looks and worry that the no-sew stuff would come off even though it's not supposed to. 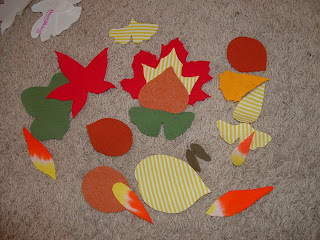 If you want to make your own turkey, I've included the traceable leaf shapes I used for it at the bottom of the post. Or I'm offering the leaves we had leftover to one lucky person...with the disclaimer that I need to remember where I put it. I'll choose someone on Friday afternoon or evening, so hopefully I can get it to you by Thanksgiving. All you need to do if you want them is to leave a comment (and if you're a follower, that's nice to) and make sure to leave or email if your blogger account isn't set up to let me automatically reply to your post. 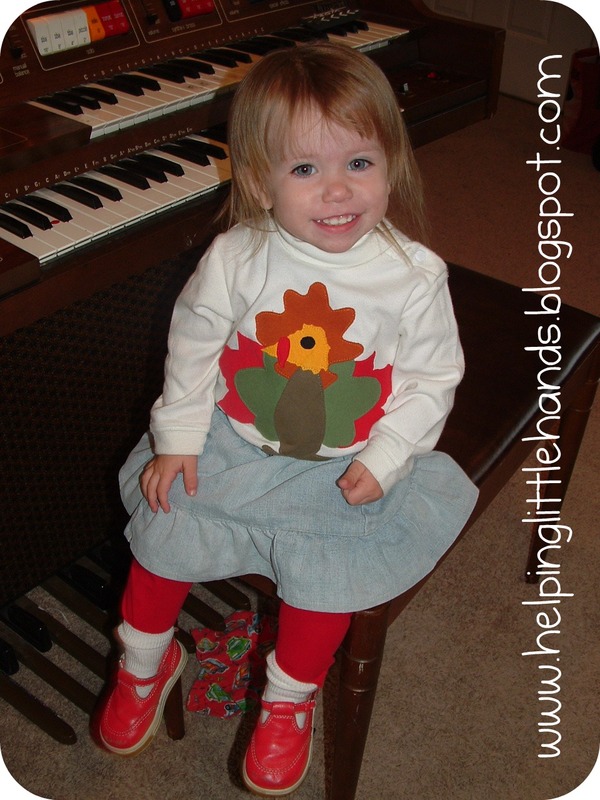 Click here to get the printable leaf patterns. The shirts turned out great! The ideas are limitless. Thanks for the giveaway. I have never tried the heat -n -bond before. I know once I do I would be hooked! 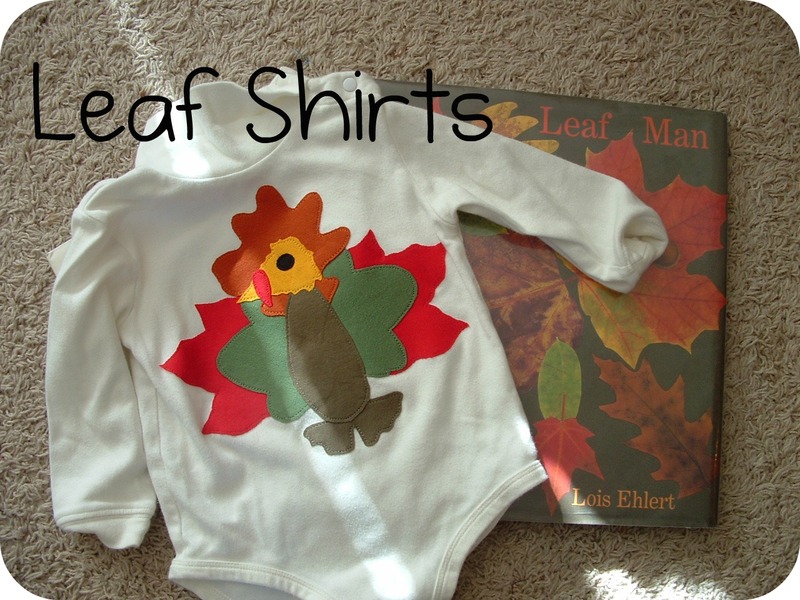 I'm a follower and would love to put together a leaf man shirt. Thanks for the offer!! Wow, the leaf idea is awesome. I made my little man a turkey shirt, but I like the leaf turkey better! 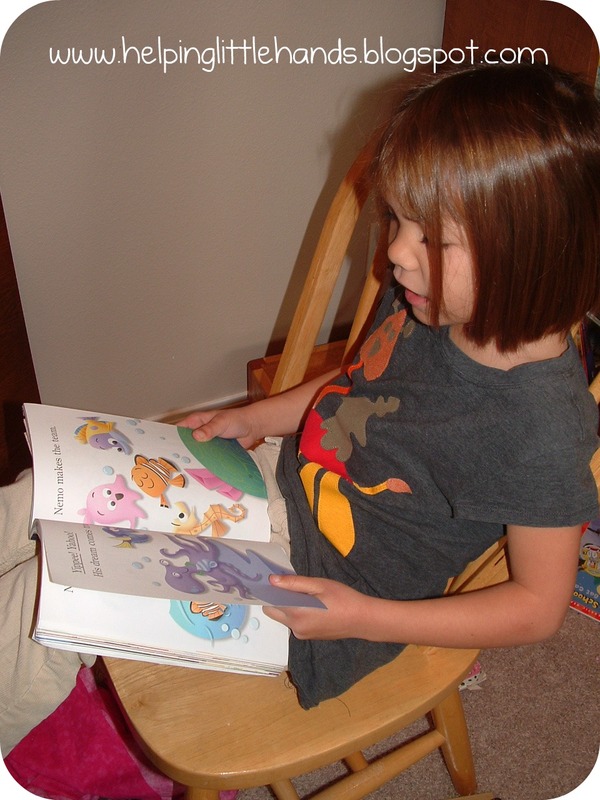 Please keep the book recommendations coming! I have a toddler who is the same age as your Sweet Pea (I think) and it can be hard to find the right books to entertain this bunch. We've checked out quite a few you've suggested and have thoroughly enjoyed them. Thank you! Thank you so much for sharing on our Virtual Book Club for Kids with Lois Ehlert. 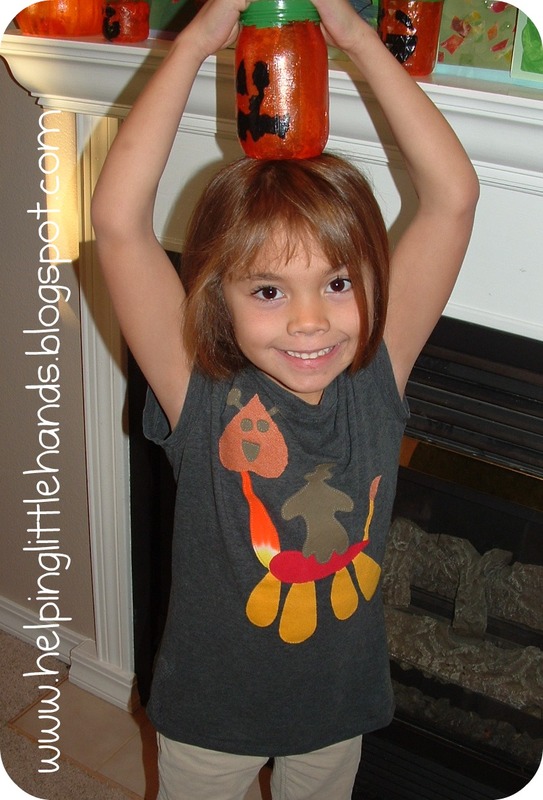 We love making handmade shirts with our girls and know that this will be a big hit for Fall. 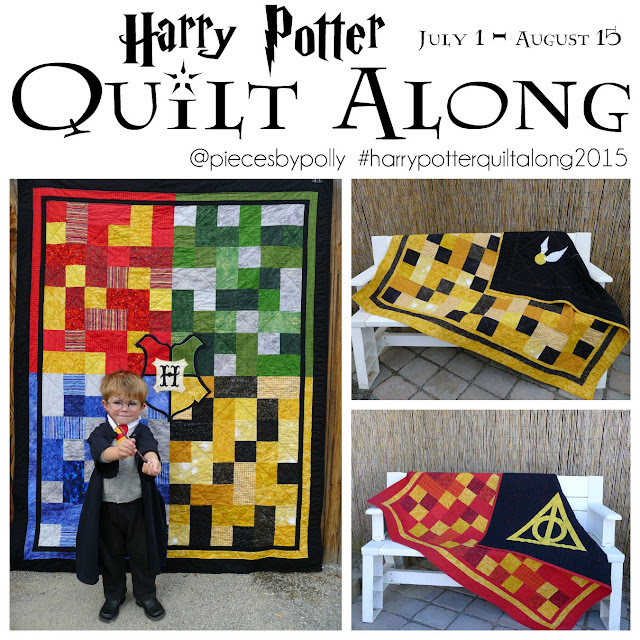 Hope you'll join us next month with Amy Rosenthal!